Watch dolphins from your bed! Right on the Beach! 3 bedrooms. So close, you can smell the ocean! Fully furnished. Direct TV and Wifi. 20 feet to sand! Beach is surrounded by Sonoran mountains. Resort-size swimming pool. 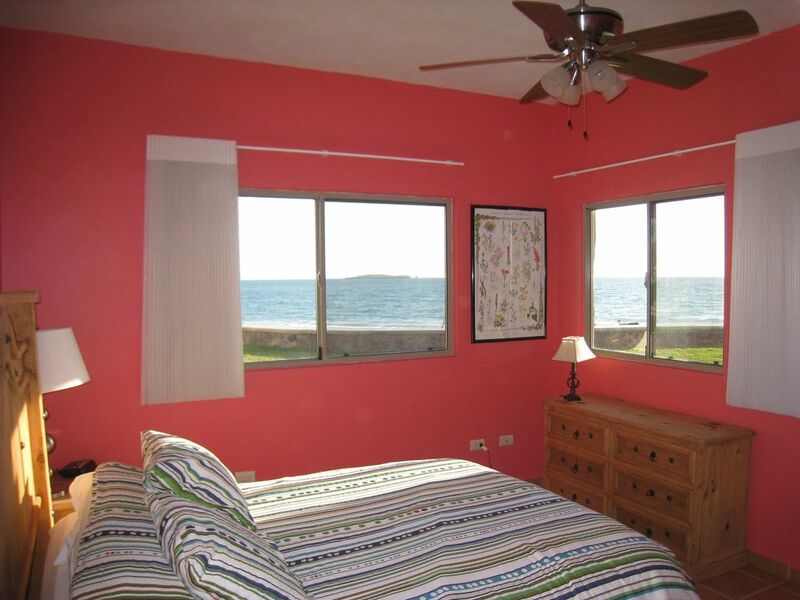 Bahia Delfin Condos are on a 5 mile long sandy beach next to a protected estuary. Birdwatchers' heaven! You can rent kayaks just down the beach. Kayak out to islands right in front of condo. There you can snorkel in clear blue water up to sixty feet. Huge fish and other wildlife. Surf fishing is 10 seconds from front door. Bring boogie boards and skim boards. The beach is awesome! Huge windsurfing and catamaran sailing area! We are the first owners buying when the units were first built. I own a 3 & 4 bedroom. We rent both units. Look at our reviews. We have the best units because of the location and investing in nice, quality beds and furnishings. 3 steps to the sand! This is the front row! The ocean is right out the front door! We had a great time, the condo was right on the beach! The kids loved it. A few things to be aware of... as stated in many of the reviews, you need to make sure you bring paper towels, toilet paper, trash bags, etc (this really should be pointed out by the owner). Also, the condo is on the edge of the complex and the adjacent beach and desert area is public. There were no problems with loud crowds (as noted in one of the reviews) but we did have some things stolen off the porch on our last night (fishing pole, tackle box, etc). Otherwise we had a wonderful time. Be sure to visit the Delfinario while you're there (it's only 10 minutes away and you can have an up-close encounter with dolphins and sea lions for a fraction of what it'd cost you in California!). Enjoyed watching the dolphins in the mornings, excellent location and place was very clean. Great communication by the owner as well! The condo is nicely decorated and only few steps away from the beach. The place was spotless and beds were comfortable. The environment boosted our vacation time in San Carlos. The condo is highly recommended! Nice condo, very clean and just a few steps from the beach. We gad a very nice stay here. Be warned to take bath soap, shampoo and other kitchen articuls such as paper towels, napkins and cleaning cloth for kitchen counter ! House is beautiful and has everything you need. Waking up in the morning and be able to see the dolphins go by was wonderful. Highly recommend. Thank you. The biggest reason guest return! There are few places where you can sit up in bed and see dolphins! Great place peaceful and comfortable. Will come again great customer service, you wont regret it. One of the only condos on the beach that has wifi and satellite. Stay connected and/or watch all your favorite teams or show!